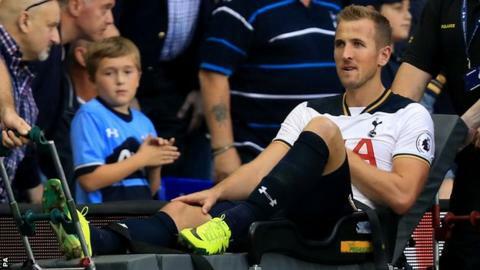 Tottenham striker Harry Kane's ankle injury scan results are "much better than expected", says manager Mauricio Pochettino. Kane, 23, is out with ligament damage suffered during his side's 1-0 win over Sunderland on 18 September. Pochettino again did not confirm when the England international would return but said his time out may have been reduced. "It's a very positive scan, we are very happy," said the 44-year-old. Spurs travel to CSKA Moscow in the Champions League on Tuesday and Pochettino confirmed France midfielder Moussa Sissoko will miss out with concussion. The Argentine added that midfielders Eric Dier and Mousa Dembele will not be risked, despite returning to training after also suffering injuries against Sunderland. Defender Danny Rose is close to returning from a hamstring injury but will not travel to Russia.